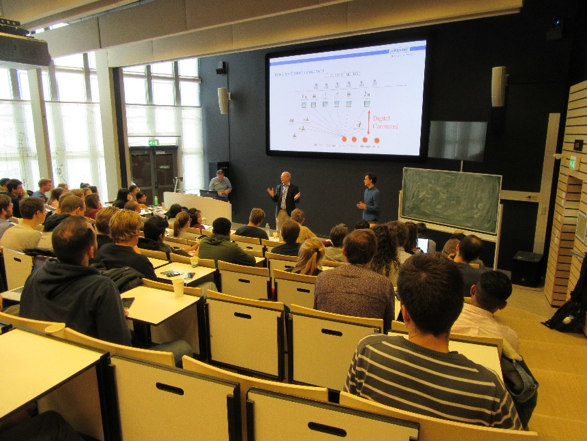 In collaboration with Wouter Beelaerts we organized a guest lecture given by Pim Stam about the continuous improvement within Krohne Altometer. Pim is part of the Krohne Lean steering committee. It consists of 2 people working full time on improving the performance of the company. During the presentation Pim told us about the different techniques that the committee uses to, for instance, reduce waste. To put it simple, waste can be seen as any step in the process that does not add value to the product. Examples of waste are waiting, transportation, over-production, etc. Krohne did not implement these lean techniques overnight. They first started a few years back with Kaizen (first used by the Toyota Production System). The cycle of the Kaizen Activity can be defined as: “Plan -> Do -> Check -> Act”. The purpose of Kaizen is to humanize the workplace, eliminate overly hard work and teach people how to spot and eliminate waste in business process. The introduction of Kaizen had a positive effect and the board was convinced that lean techniques were of value. In time also Lean Six Sigma (introduced by Motorola in 1986 to compete with the Japanese Kaizen) and TPM (Total Productive Maintenance) were introduced. Next to these techniques, also Smart Industry or Industry 4.0 was shortly discussed. This new kind of industry involves around the automation and data exchange in manufacturing technologies. What is interesting to mention is that these techniques only work when everyone in the company is involved. Everybody has to be like-minded to make these changes work. This seems like something trivial, but is often the reason why implementations of new techniques fail. Pim solves this problem by communicating with the people on the work floor to find some of the biggest issues, he also has to convince the board that these changes will have a positive effect. Only after a “green light” given by the board, the committee can start to implement the changes. A couple of us have visited Krohne Altometer during the Germany trip, there we have seen in practice how it works. This guest lecture was the perfect opportunity for the ones that did not visit the company to see how these techniques are used in the industry.